More than 40 people from different parts of the city received burn injuries while bursting crackers on Diwali night. Dr Valsa Varghese, in charge, trauma centre and deputy medical superintendent, Christian Medical College and Hospital, said,"We received eight patients with minor burn injuries. They were give first-aid in the hospital and sent back to their respective places. However, we did not receive any patient with major burn injuries." 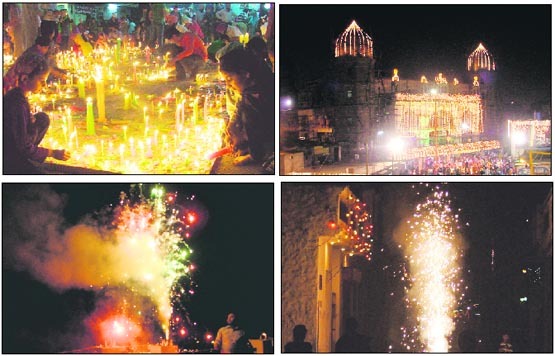 Though city residents, having no dearth of money, enjoyed fireworks worth over Rs 20 crore during the festival of lights last night, cracker dealers have expressed their "dissatisfaction" over the “meagre” sale of crackers to residents this Diwali. 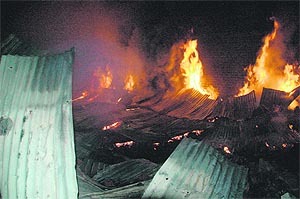 As many as 42 fire accidents were reported in the city on Diwali night. Out of these, a major fire incident was reported at the godown of Atam Textile at Papita Street near Sabji Mandi. Sandeep Jain, owner of Atam Textile Private Limited, said, "We had stored yarn raw material in the godown at Papita Street. Due to fireworks, it caught fire yesterday night around 9 pm. The loss is in lakhs of rupees. When the country was drenched in Diwali festivity and people exchanged gifts, there were a few who left the priceless gift of vision for the needy. 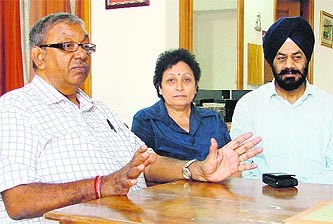 The kin of the noble souls donated three pairs of eyes to Punarjot Eye Bank on Diwali. The Festival of Lights has given a special gift to a few families. At Christian Medical College & Hospital and Dayanand Medical College & Hospital, three families were blessed with two baby girls and two baby boys. Harbhajan Singh, father-in-law of Harvinder Kaur, who has been blessed with a baby girl at CMCH, said, “We are from Shergarh village of Ludhiana district. My daughter-in-law gave birth to a girl child at 10.30 am.” Gurdeep Singh, father of the newly born, was equally happy. Meenakshi with her newborn son at the DMCH. In yet another blow to those thinking of getting a home or an auto loan or the ones who have already taken the loan, the Reserve Bank of India (RBI) has decided to increase the interest rates further. 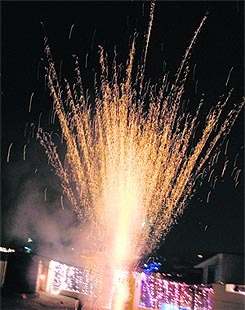 Notwithstanding the guidelines issued by local administration regarding the sale of fireworks in the town went on unchecked in almost all the areas of the city on Diwali, which has raised many questions about the ability of local administration. Even as Ludhiana has been recoginsed as the fourth most polluted city in the world, its residents seem to have little concern about the air they breathe, as firecrackers worth crores were burnt last night. The solid waste collected by the municipal corporation the day after Diwali was more than double the garbage collected every day in the city. According to the MC, around 1,400 metric tonne garbage was collected by the evening today, which is around 40 per cent more than the average daily garbage generated in the city. The overall waste generated on Diwali is much higher as these figures exclude the waste generated by the burning of firecrackers across the city on the Diwali night, as the entire garbage is not collected. The Hindus, along with followers of other religions, lit up their houses and business establishments to celebrate the festival of lights yesterday. Though the traditional worship of Goddess Lakshmi was restricted to Hindu families, illumination of premises, relishing of special dishes and bursting of crackers was common among all communities. Patriotic fervour gripped the region on occasion of Diwali when a large number of enthusiasts paid tributes to martyrs besides worshiping Godess Lakshmi and other deities. 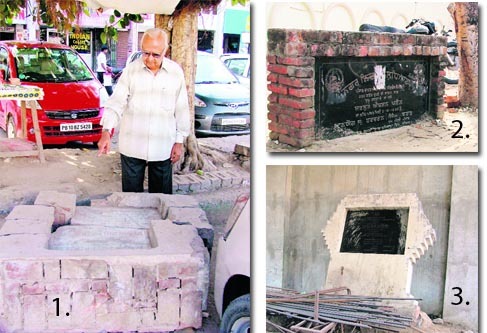 Besides illuminating their houses and business establishments, the residents commemorated to take care of memorials of martyrs and freedom fighters too. 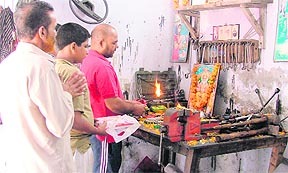 The workers and the factory owners today worshipped their tools and the Lord Vishwakarma, here today. The day was observed after Diwali and is also called Gudi Padwa or Govardhan Puja. On the occasion of Vishwakarma day, employees of DMCH today organised puja and langar with traditional fervour and gaiety. About 20 days ago Silva Devi a South African woman came to city along with her husband H Sewnarayin for the treatment of her ankles and knees as she suffered from Arthritis. After arriving, her husband also decied to undergo Zerona Treatment. But next time the couple wants to visit city for feeling warmth and hospitality. The LMA has started an initiative to empower upcoming, micro and small women entrepreneurs as part of its agenda to promote entrepreneurial and professional development in the region. The samples of 225 quintals of pickle which were seized from two godowns by the health department on October 19 have failed. If a headless body spread panic in the Prem Nagar area on October 24, it was the turn of residents of Geeta Nagar to witness horrifying scenes after stray dogs were found running with the head of a woman here yesterday. A 15-year-old girl allegedly committed suicide by hanging herself with a ceiling fan at Manohar Nagar near Model Town here yesterday. 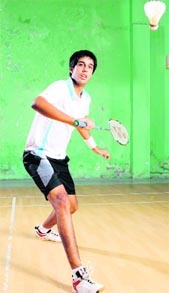 Local shuttler Pranav Chopra continues to hog the limelight at international tournaments by winning medals in the doubles category at Sofia (Bulgaria), Almere (Netherlands and Bern (Switzerland). Currently taking part in the European Circuit Badminton Tournaments, Pranav (ONGC) stamped his class by pairing with Akshay Dewalkar (Air India) to finish among the position holders. A trainee of the Ludhiana Badminton Academy, Pranav along with Akshay secured a silver medal at Bern. After overcoming seeded players, Pranav and Akshay went down fighting in the final against second seeded pair of Lukasz Moren and Wojciech Szkudlarczyk. They lost the verdict 17-21, 21-16, 21-12 to content with second place. A large number of paddlers in the boys and girls’ sections as well as men and women’s sections are expected to be seen in action during the Open Punjab State Ranking Table Tennis Championship scheduled to be held here at Shastri Hall, near Guru Nanak Stadium, from October 28 to 30. Fang Jenn Chiu, honorary secretary, Ludhiana District Table Tennis Association, said players born on or after January 1, 1991 are eligible in the youth category, while those born on or after January 1, 1995 are eligible in the junior group.